Millionaire Billionaire Tycoon can be played on Android devices from the Play store. It is an idle game without much clicking. You buy buildings, and then you can buy auto-clickers and upgrades for the buildings! Go get the game if you do not have it already, and enjoy this guide! This is where you can buy all the buildings. There are 10 different types of buildings that are available to buy. They are the Soda Stand, Pet Shop, Comic Store, Diner, Arcade, Cinema, Mall, Cruise, Sports Team, and Space Tourism. 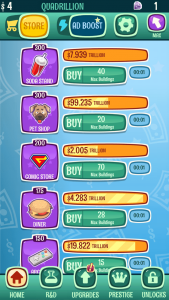 In the beginning, before you can afford the auto-clicker, you have to manually tap the buildings to have them run and make cash, but when you buy a new building, it also runs for you, so you will not really have to click, you will just have to keep buying businesses until you have enough for the auto-clicker. In the top right corner, there is a button that you can use to buy multiples of each building. You can either buy 1, 10, 25, 100 businesses, or the max you can buy with the money you currently have. This makes it much easier, because you will have a lot of buildings quickly in this game, and I would recommend using the max buildings buying as much as you can. 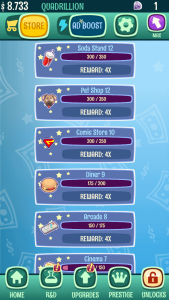 The buildings are how you will get all of your money in this game, everything else is just boosting or giving upgrades to these businesses. Research and Development is where you will buy the auto-clicker for all the buildings. 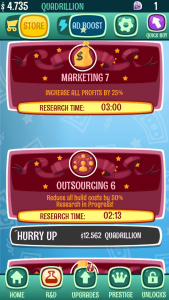 You can also buy research that will increase profits, decrease building cost, and increase speed of the buildings. You have to buy the research, and then have to wait a certain amount of time for it to be ready. You can instantly finish any research using money, but it costs more to instantly finish than it does to start. The cost to instantly finish goes down the less time left there is, so sometimes it pays off to finish it a bit early if you have the cash on hand. There is also a “Quick Buy” button in the top right corner. This will quick buy the first research that you can afford, and it will also purchase instant finish if it is available. There are three different types of upgrades in Millionaire Billionaire Tycoon, and they apply to all building types. 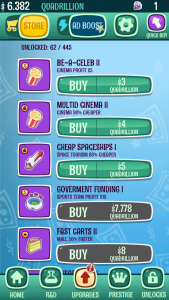 There is a profit multiplier upgrade, a speed increase upgrade, and an upgrade that makes each building cheaper to buy. The 10 cheapest upgrades show up on the screen and are available to buy at a time. Each time an upgrade is bought, a new upgrade shows up at the bottom of the list. These upgrades are very helpful, so if you see one for cheaper buildings, buy it before buying any buildings, it will add a lot more buildings that you can actually buy than before the upgrade. This is how you advance to the mid-game and late-game stages of Millionaire Billionaire Tycoon. When you make money, you also gain prestige that you can claim. Claiming prestige resets all your buildings, R&D, and upgrades, but it gives you the prestige. You get a percentage bonus for each prestige you have, and this can be upgraded. 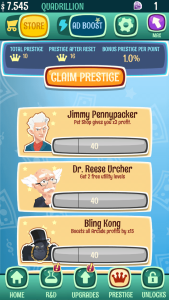 You can use prestige to buy things, such as profit multipliers, free buildings, cheaper upgrades, and higher prestige percent bonus. This will be vital to progress far in this game! The unlocks page shows how many of each business you currently have, as well as how many you need for the next unlock. These unlocks add a profit multiplier to its own building. These are milestones that will help a lot in gaining more money. It is almost always better to buy a building to the unlock, as that will not only give cash for each building of that type, it will add a multiplier for that building type which will increase cash output greatly. I would recommend this game, especially since it does not have constant clicking. You can earn cash offline, so you can put this game down for a bit, and still have a constant stream of cash!